For overnight hire with unlimited prints. Beautiful 50 page leather bound photo album included. NOTE: Excludes red carpet and bollards. Curtains available in white, red, black. Includes unlimited photo prints during the entire hire. Beautiful 50 page leather bound photo album included. Props are supplied with every hire. Upload immediately to Facebook, Twitter or Smugmug. Free delivery, Setup and Pickup. 15 mega pixel DSLR camera for outstanding quality pictures. Archival quality prints – professional dye sublimation prints. Variable print size 2×6, 4×6, 5×7, 6×8, 6×9. Photos are copied to a USB Flash Drive at the end of the event. 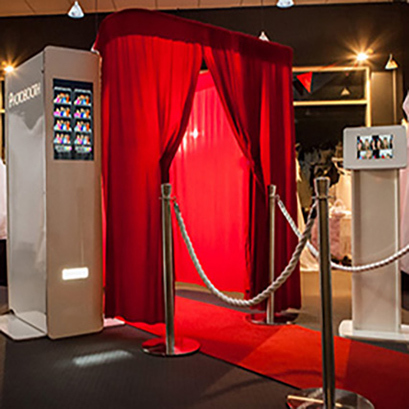 Customisable photo booth exterior, user screen and Print graphics.